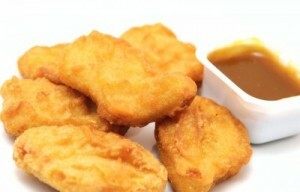 Consumer Reports tested 14 brands of Chicken Nuggets, comparing taste and health of the brands. What they found is that consumers can choose one, but not both from their nuggets. Jamie Oliver recently brought chicken nuggets into the spotlight with his ABC reality program, “Jamie Oliver’s Food Revolution.” Children happily ate their nuggets, despite watching the process of how the chicken parts were processed and blended together. Knowing how well loved chicken nuggets are, Consumer Reports decided to compare 14 different store brands in their healthiness and taste. Gayle Williams, deputy editor of Consumer Reports Health, urges parents to not just look at the claims made by the company selling the food, but to also compare the nutritional information listed on each package. For instance, while Tyson claims their chicken nuggets are “all natural”, the testing found 470 milligrams of sodium per serving. Of the brands tested, the ones that rated as good in taste were high in salt and fat. The brand that scored “very good” in nutrition, Health is Wealth, was rated as not tasting good according to the taste testers. “There’s the rub. The brand may be more nutritious than others, but if your kids won’t eat it, what good is it?” said Williams.